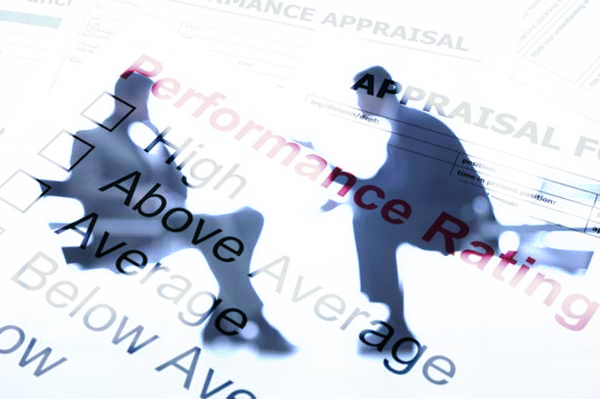 Teacher Appraisal – a fait accompli? The bone of contention with appraisal stems from inconsistent approaches in two key areas: the first, outlined above, is centered around target setting; that being what is set and the manner in which targets are set. The second, I believe, is how appraisal is fully embedded (or not) within a school’s teaching and learning model. Recently, at a national conference, I had the displeasure of hearing an executive headteacher from a large academy chain share views on how ‘performance management’ is undertaken within their organisation: “we don’t bother with observations, work scrutiny etc, etc, if a teacher gets the results from their classes then they pass their performance management and receive pay progression, if they don’t get the results then they fail.” My moral compass would never lead me down this road, ever. And in my opinion, this sort of ill-conceived and careless approach is what gives true appraisal bad press and of course, has a significant impact upon teacher wellbeing too. My personal stance is that appraisal should be rigorous but most certainly not ruthless. It should be mutually beneficial to both whole school development priorities and the development needs of the individual being appraised. Ultimately and essentially improving the education for all students within a school. Consider the context of numerical targets – percentages, for example, X% of students will achieve Y%; it is impossible for teachers to guarantee this. Remember, don’t make the assumption that pupils make linear progress. Base SMART targets around students outcomes in the context of progress (this could focus explicitly on a micro cohort), for example, it is totally unacceptable to hold any teacher to account for examination results in their entirety, as progress over three, four or five years could be attributed to a number of teachers and this sits with the school accountability, not necessarily an individual teacher. Encourage teachers to draft their own objectives prior to the target setting meeting, this could be in the form of an audit against the teachers standards and will spark a productive dialogue, leading to mutually agreed targets. Targets must differentiate to underpin the development of teachers at different stages in their career. Holding an expectation that a teacher will influence or change matters over which they have no control and then making judgments about their teaching and pay on this basis is ruthless and unreasonable. We have a duty to prioritise wellbeing and must explore strategies for achieving a work/life balance for all teachers, this should underpin the rationale for target setting. I remember my first encounter with performance management following the successful completion of my NQT year. A brief meeting with my head of department where I was given specific targets, asked to sign to confirm I agreed, which I obligingly did and then these were placed into a personnel file that would reside in the headteacher’s office until the following year. This is not good practice, obviously. Therefore there is a need to not only carry out the appraiser/appraisee meeting but also to maintain this ongoing dialogue throughout the year. A mid year review is recommended because it would be unfair to dig out the folder and simply tick met or not met one year on, this is ruthless not rigorous. 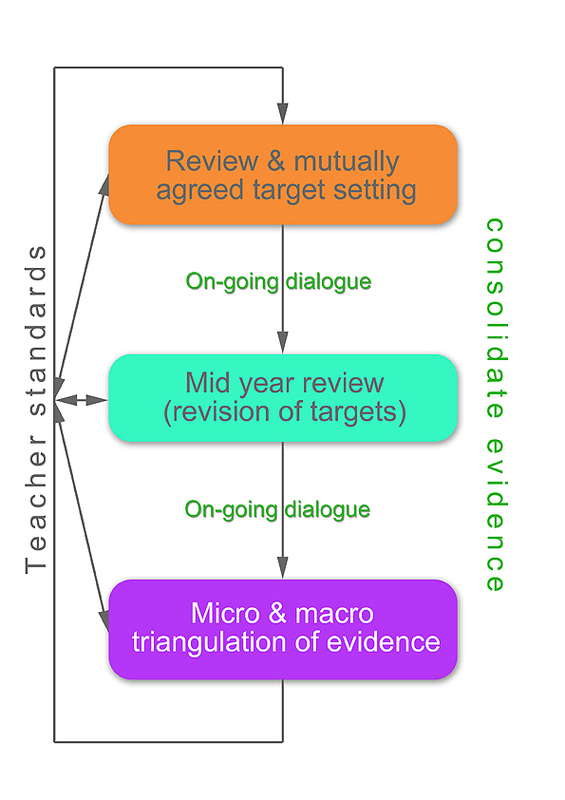 As previously mentioned, if all teachers reflect upon their practice and audit themselves against the teacher standards prior to the target setting meeting, this will not only help them evidence their training needs but also assist the school in planning their bespoke CPD requirements, informing the CPD model (see below). Lesson observation is where I personally have an issue. 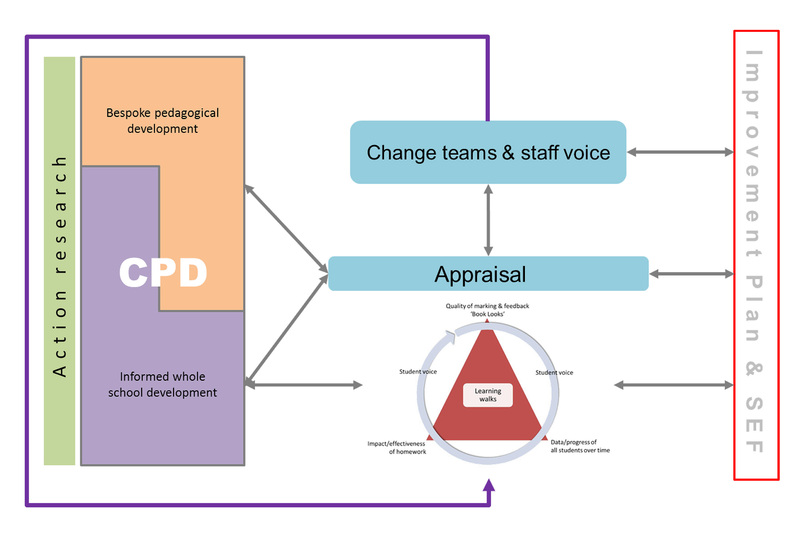 If an observation forms a significant part of the evidence to inform appraisal and pay progression, then by its very nature this becomes high stakes, and we all know what happens when this is the case. For this reason there is an unquestionable need to embed the appraisal process within a teaching and learning model and one that looks at the big picture over time (micro & macro) making this fair and justified. Of course, this needs to be fit for purpose in the first place. Now that pay is linked to teachers performance, it is essential that schools provide an appraisal process that captures teachers strengths and successes but at the same time identifies aspects of practice that need to be addressed, setting high levels of challenge in a clear, rigorous but not ruthless way. I’d be interested to hear your views and experiences around appraisal and in particular what works well for you and your school. Deputy Headteacher - leader of Teaching & Learning. Change maker and believer in quality first teaching. As my target of 85% of pupils achieving all 3 of Reading, Writing and Maths in y6 2016 was set in October, I laughed. I said it was nonsense and that we didn’t even know where the goalposts were, never mind be in with a chance of scoring. At the mid-year review, the HT also laughed and said in retrospect the targets were absurd. OK, but I knew that THEN. I may be the assessment ‘expert’, but I’m not the boss. Enter your email address to follow Gary's educational blog and receive notifications of new posts by email.